Anderson associates develop strong working relationships with retailers in order to provide a higher level of service and the best results for clients. Anderson associates develop strong working relationships with retailers in order to provide a higher level of service to clients. 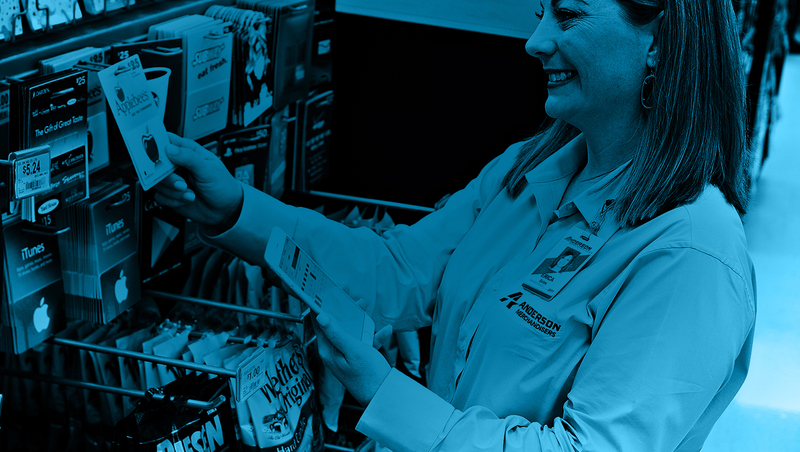 Day in and day out, our associates identify issues at the store and shelf levels and proactively implement improvements to make certain shoppers always find your products in the best light. We call this approach being “entrepreneurial on your behalf,” and this philosophy is ingrained in every Anderson associate. Collaboration – We practice continuous communication in defining strategic goals and expectations regarding all marketing, merchandising and sales initiatives. Pre-Sell and Awareness – To ensure the best results, we collaborate with retailers and suppliers to design, implement and deliver effective pre-sell communication to sales management and reps, store operations at all levels and consumers, as applicable. Reporting – By leveraging our enhanced DASH Analytics™, we provide real-time survey and sales-enabled dashboards that support immediate program adjustments based on in-store insights, sales and inventory productivity. Post-Reporting Analysis – We immediately follow up with retailers and/or suppliers, store operations and merchants (where applicable) to leverage results that identify new opportunities to drive future business.